Walking into one of Turner Galleries’ Engine Rooms to view Nathan Beard’s solo show, “Siamese Smize”, I suddenly feel uneasy, as though I am being watched by 22 pairs of eyes. 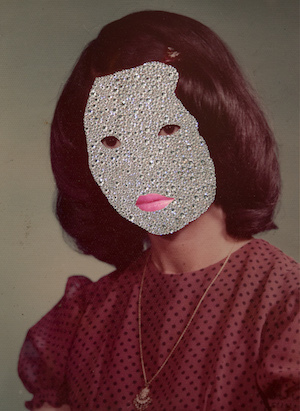 The eyes belong to the people in a collection of photographs found in Beard’s mother’s abandoned home in Thailand, the faces of which have been masked with glittering Swarovski crystals, leaving only their eyes exposed. Their lips hover in front of the image, printed on the acrylic face of the frame. The masks flatten the faces of people in the portraits into coloured or patterned shapes. Whilst this uncanny shift is slightly discomforting, the expressions on the faces still appear pleasant and calm; as if this visage can be deciphered solely from the eyes. The word “smize”, referenced in the title of the show, is slang for “smiling with the eyes”. It’s used here in amalgamation with “Siamese Smile”, a phrase adopted by Thai tourism industry in the late 1980s which fetishized and simplified “Thainess” for a Western audience. The statement from Beard that accompanies the show goes on to explain that there are “at least 13 different expressions for smiles” in the Thai language. In contrast, Beard has used mostly staged portraits of similar expression and body language. This unoffending body language changes as one moves past each image. As the floating lips position in relation to the face shifts, so too does our interpretation of the wearers’ smile, from pleasant to bizarre. The kitschy crystal embellishments reference both a contemporary South-East Asian aesthetic of clothes and accessories, adorned with crystals and pop culture, and traditional Thai patterns found on ceramics and silks. Through their value, and painstaking application, the crystals also memorialise the subjects of the portraits, honouring Beard’s relation to them as family and as a connection to his own Thai heritage. Yet another highly polished (and glittering) body of work from Beard, the portraits in “Siamese Smize” successfully balance the viewer between uneasiness and familiarity. Asking what is truly behind a smile, or a perceived national identity, this exhibition is a playful search for authenticity as Beard explores his Thai-Australian heritage. Nathan Beard’s “Siamese Smize” is one of four solo shows at Turner Galleries until October 13. Pictured top: Detail from Nathan Beard, “Haltribe Sawatdee Thailand” digital print, printed acrylic, swarovski elements, 52.8 x 72.8 x 4cm, 2018.